A fume hood is one of the leading safety devices used to protect individuals from exposure to chemicals. 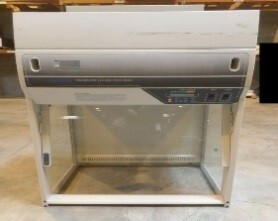 This ventilated enclosure is connected to an exhaust fan which draws air from the room, through the hood opening, and out through the ductwork. 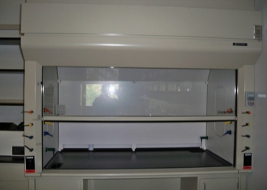 A conventional fume hood is used for manipulation of hazardous/volatile material, and column chromatography. Ductless Fume Hoods are stand-alone enclosures that filter out hazardous fumes and vapors using HEPA and carbon filters. When the hood is on, air is drawn in from the front side, filtered and released back into the room. Ductless fume hoods are ideal for soldering, histology, sample preparation, and work involving small quantities of low hazard chemicals. For conventional fume hoods, EH&S inspects the hoods and tests the face velocity to ensure it is working as designed. Face velocity is a measure of speed of the laboratories air that enters the fume hood’s face opening. The face velocities need to be high enough to contain fumes but not high enough to cause air turbulence between the hoods face and laboratory workers; an average 80-120 feet per Min (fpm). EH&S contracts an external company to inspect and certify ductless fume hoods on an annual basis. Contact EH&S to obtain the most recent inspection data.